Notre confortable get away est situé sur la colline surplombant la ville de Mariposa dans un quartier résidentiel calme. Nous sommes à seulement trois minutes du centre-ville de Mariposa et 45 minutes du parc national de Yosemite. Pour rendre votre séjour confortable, notre appartement peut accueillir deux personnes et offre une salle de séjour, chambre, salle de bain complète et une kitchenette. Un parking privé est disponible avec une entrée séparée et vous mène à une cour joliment aménagé qui offre un patio privé et d'une piscine semi-privée. Une chambre joliment décorée vous accueille avec des draps en peluche et un lit queen-size pour une nuits paisible repos. Le salon est équipé d'un mobilier confortable ainsi que WiFi, TV écran plat, des jeux et des livres sur Yosemite à partager. Dans la kitchenette, vous trouverez tous les équipements habituels; une table de cuisson à induction et un micro-ondes sont fournis à la place d'une cuisinière. Il existe de nombreux sentiers de randonnée dans les environs où vous pourrez voir toutes les formes de la faune. Se il vous plaît consultez notre profil ci-dessous pour plus d'informations. Nous avons hâte de vous entendre. Les propriétaires vivent sur les lieux. Nid de Robin est une suite d'invité attaché avec une entrée privée. Comprend des articles de toilette et sèche-cheveux. Si vous souhaitez vous dégourdir les jambes en début de soirée, une promenade lente autour de la boucle Mueller Road (près d'un mile de) ou marcher en ville (un mile descente). Votre promenade sera rempli avec une variété de la flore et de la faune et de la faune allant de cerfs timides pour hiboux somnolents. Vous pourrez également être traitées à des vues du centre historique de Mariposa. 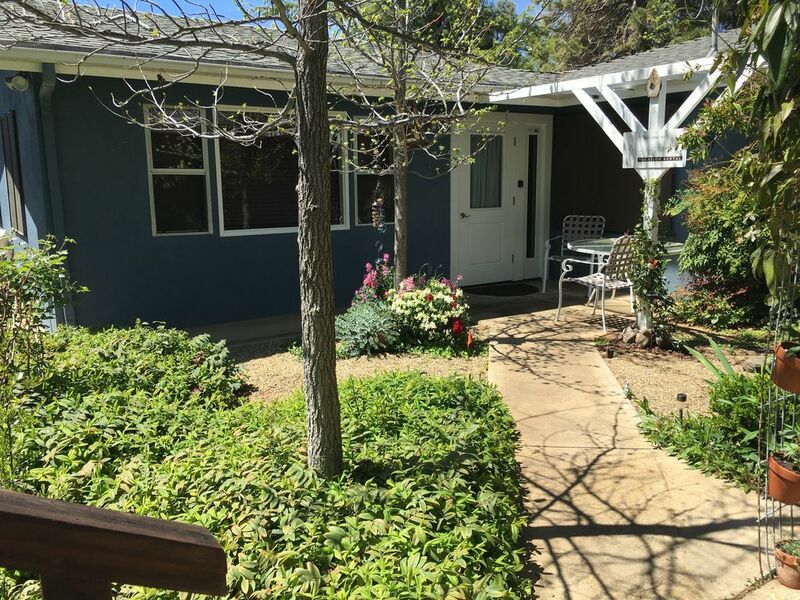 Great property, 1 hour away from Yosemite, few minutes away from downtown Mariposa. The "nest" has everything you need plus more. We were very pleased to see some welcome treats and having drinks and food items in the fridge for the guests is very nice touch. The kitchen has all the appliances that you will need to make breakfast, lunch or dinner. The bed is very comfortable and so is the sofa. All in all we really enjoyed our stay and hoping to book it again in the future. Thank you Robn and Trace for making our stay very welcoming and enjoyable and providing everything we need to make our vacation a very good experience all around. We truly enjoyed every bit of the "nest". We enjoyed having you stay with us and are so happy you enjoyed your time in Mariposa and Yosemite. Even with the rain, you managed to be comfortable and get the rest and relaxation needed. We look forward to having you stay with us again and appreciate the great review. Robn and Trace were wonderful hosts Checked in with us and provided tips for Yosemite. Their "nest" has everything you need. In addition thoughtful touches, like fruits and drinks in the fridge and little treats in a basket. The place is very quiet and one hour from Yosemite Valley. It was great having you stay with us and we thank you for your kind review. So nice to see our guests appreciate and enjoy Yosemite and all it has to offer. Hope to have you stay with us again. The absolute perfect place to use as a Yosemite home base. Robn & Trace have created the perfect place to set up and explore Yosemite. My wife and I stayed here in October 2018 (an ideal time of the year to explore Yosemite, in my opinion - less crowds, and the weather is still mild). Parking was easy, with an assigned spot. Bed extremely comfortable. The unit was clean and tidy. The owners were friendly and readily available to answer all questions and provide recommendations on hiking trails and routes into Yosemite. Trace, a former park ranger, was there to greet us when we arrived, and show us the apartment. The quaint town of Mariposa has everything you need - good restaurants, stores for provisions, and a couple of places to have a brew after a long day of hiking. It takes an hour of beautiful driving to enter the park from the western or southern gate. We even encountered a trio of wild deer in the front yard when we arrived the first night, and a rafter of turkeys was roaming the neighborhood on our way to the park the first morning. The stars in the sky were innumerable. We were exceedingly pleased with our stay and will definitely stay here again on our next trip to Yosemite. We couldn't have asked for a better review. Thank you so much! It is always such a treat to meet our guests and not only make their stay as comfortable as possible, but to also share our love of the Sierra Foothills and Yosemite National Park. You chose a great time of year to visit and really seemed to appreciate and enjoy the beauty and splendor Yosemite has to offer. We are excited to have you stay with us again. My husband and I loved our relaxing stay at Robn's Nest. Robn and Trace were such friendly hosts. The space is extremely comfortable and has everything you might need. After hiking our way through Yosemite, it was wonderful to come back to cozy Robn's Nest. We would stay here again without hesitation. Thank you for your wonderful review! We enjoyed having you as guests and love it when our guests enjoy their time in Yosemite. You chose a nice time of year to see the Park. Hope you stay with us again. This was an amazing place for us to stay while we visited Yosemite. Trace is an expert on Yosemite and was able to give us great tips on the park. Robin and Trace are both very inviting. I strongly recommend for anybody thinking about renting their place. We really enjoyed talking with you each evening about your experiences in Yosemite and exploring different parts of the Park such as the Tioga Road corridor and Tuolumne Meadows. If you come back to Yosemite, Trace would love to take you on one of his favorite hikes. We are so happy you were comfortable staying with us and really appreciate the great review! We had a fantastic time at Robin's Nest! Trace and Robn are very knowledgeable about the surrounding areas and are more than willing to give great advice. The unit was the perfect size for two people and provided us with everything we needed for a weekend stay. No complaints!! We really appreciate the great review and really enjoyed spending time getting to know you both and sharing our love of Yosemite and hiking. It makes the experience of having a vacation rental so much nicer with guests like yourselves; so personable and friendly. Hope to have you stay with us again and may join you on a hike in the high country. Parc national de Yosemite, la randonnée, la natation, rafting. Signed rental agreement due at time of reservation. An advance payment equal to 50% of rental rate is due upon reservation, and the remainder paid in full 14 days prior to arrival. Cancellations made more than 14 days prior to arrival date receive 50% of rental in return. Cancellations made after the 14-day date will receive no refund.